The use of cell phones while driving plays a role in 1.3 million crashes each year, causing 500,000 injuries and 6,000 deaths according to the U.S. Department of Transportation. 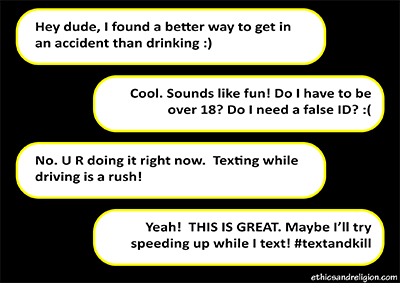 Text messaging is the most dangerous practice, making a crash 23 times more likely! Last week the driver of a large pickup truck in the Texas Hill Country slammed head-on into a church bus, killing 12 senior citizens and their driver who were coming back from a church retreat. At least three 911 calls by citizens were made before the accident, reporting the "erratic driver" of the truck. Two of those calls came from two different rural counties, from a driver of a car behind the truck. The pickup was seen crossing the line to face oncoming traffic a number of times. The driver of the car which reported the "erratic" truck driver to the sheriff, speculated that he was texting, and would cause a head-on collision. Unfortunately, before police officers found the truck, it had already crashed, killing all but one of the bus passengers. The question is what can be done to sharply reduce texting while driving? Currently, 44 states ban texting while driving. Texas is one of the states without such a law. It only bans texting by school bus drivers. Arizona and Montana have no law at all, and Mississippi, Missouri and Oklahoma only ban texting by drivers under 21 or those with a learner's permit. The states banning texting typically impose a fine of $20 to $500, depending on the state. Some states file criminal charges - particularly if the offense resulted in bodily injury or death. If the harm is severe or caused death, a driver might face prison time. The severity of punishment increases with repeat offenses. Other consequences might include adding of points to one's driving record, suspension or revocation of driving privileges, mandatory road safety classes and vehicle impoundment, especially if there is great bodily injury. But distracted driving due to texting by drivers - especially by teenagers - is a major problem in America. Teens who text while driving spend approximately 10% of their time outside of their lane! However, teens charge "Adults do it, too!" Indeed, 48% of young drivers have seen their parents drive with talking on a cell phone, and 15% say they have seen their parents texting while driving. Some 27% of adults have received text messages while driving. Also, 48% of kids age 12-17 have been in a car while the driver was texting. Finally, one in five drivers of all ages confess to surfing the web while driving. First, states without laws need to pass them, and those with weak laws must be strengthened - particularly with a greater likelihood of big fines and revocation of driver's licenses if there is severe injury or death. What can be done about teenagers, for whom texting is a big temptation? About 13% of drivers age 18-20 involved in car wrecks admitted to texting or talking on their mobile devices at the time of the crash. And 34% of teens acknowledge they texted while driving, while 52% talked on a cell phone while driving. What's most alarming, 77% think they can safely text while driving! Yet there are 11 teenage deaths EVERY DAY due to texting, according to the Institute for Highway Safety. And they are causing 25% of all accidents, injuring 125,000 people and killing 15,000 a year! Do kids and parents realize that texting is six times more likely to cause an accident than driving while intoxicated? Probably not. Parents: here is a major answer for your kids: Cellcontrol is a subscription-based service that features a device inserted under the dashboard and an accompanying app that blocks your teen from sending or receiving texts while driving! It also disables other phone features while the car is in motion, such as using email or accessing the camera. Another answer is Drive Safe Mode, an app to prevent texting and emailing while driving. It can notify a parent when the phone is in use and if the driver shuts off the app. How can adult behavior be modified? SafeDrive rewards you for not texting. Simply open the app whenever you are behind the wheel, and it will automatically start rewarding you with points you can use toward discounts at participating stores! Let's stop texting while driving. The life we save may be our own, or that of our kids!